How prepared are you for an unexpected hospitalzation? This question might make you "knock on wood" right? But knocking on wood won't contribute to the funds I'll need for paying the bills. A moment ago, I checked my wallet and guess what? I only have P1500.00 pesos and some discount cards that has no funds in it :P hahahaha s if naman kahit meron can I pay my doctors ba with it? nah!!! But on a serious note, we should be ready for this in case there's an emergency! Being an online savvy, look what I stumble into... something great that can make my P1,500.00 turn into P80,000.00! Wait don't go! This is not a networking thingy. Take a look at www.philcare.com.ph for the exact details. Anyway, this is not the first time that PhilCare is featured here on my blog. You may want to look at my previous post post for further information about the health care provider. 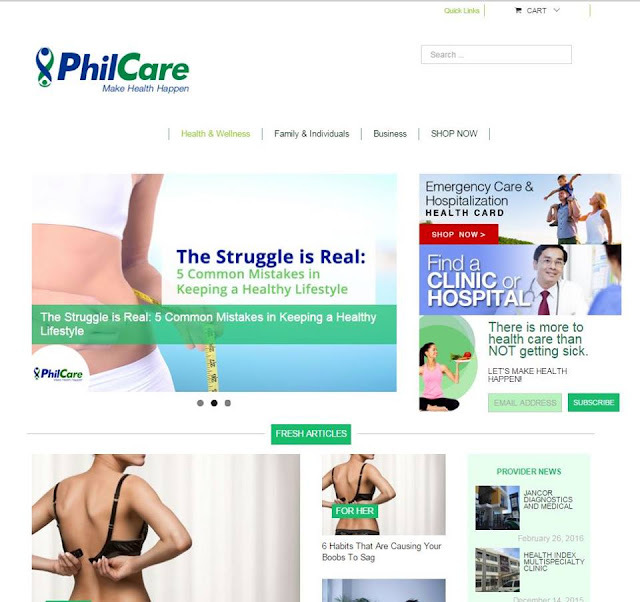 PhilCare is one of the pioneering Health Maintenance Organizations (HMOs) in the Philippines. Built by Filipinos for Filipinos, PhilCare is on the top of my list whenever I think about securing my health and my family’s health. Being a recognized HMO in the country which offers various health care packages that can fit every "Juan's" needs and budget as well, PhilCare is in its forefront of providing quality and affordable services to every Filipinos. This HMO provider has a lot of services being offered not just for corporate but also for individuals like me who is a full-time mommy and blogger. From my previous post about Smart-CheckUp that only cost about P499, here comes another prepaid health card that I love and I’m pretty sure that you’ll also love not just for you but for your family as well, the ER Vantage80. 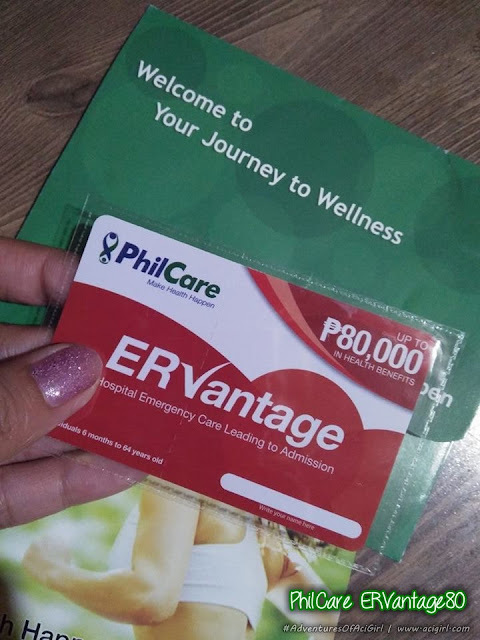 ER Vantage80 is a prepaid health card that provides coverage for emergency care leading to admission for treatment of medical emergency cases due to accident or illness at around 400+ PhilCare accredited hospitals nationwide. ER Vantage80 is so affordable for only P1,300.00 with amazing value of P80,000 coverage for emergency room care and hospitalization inclusive of doctors’ fees, laboratory and diagnostic procedures, room and board, and medicines (except vaccines) as medically necessary during confinement except for cases declared as non-coverable**. Room and board at a Private room. And the best part? No hospital deposit required! Your Order and Mode of Payments. Now how’s the process of my online shopping? For Activation, register your card through SMS indicating the name of the person to be covered, birth date, gender, and birthplace. The card can be used after 7 days from successful registration. For Availing the ER Vantage perks, present the card with a valid identification to the emergency room staff at any PhilCare accredited hospital for the ER card. I personally like this and honestly, I’m a “hoarder” of ER Vantage80 cards for me and my family of course. Months ago, DaddyO moved to a new company and his medical benefits turned back to zero. We all know here in our country that for us to be qualified for HMO benefits, we should first be a regular employee, and having kids and ehem the sickly "me", HMO membership is a MUST. Para no worries na and prepared in case of emergency. Wrapping up this awesome sharing with this thought: Your P1,300 can save you a lot of money in the future and who knows, maybe you can even save your precious life. Try to think of an unexpected hospitalization with an empty wallet, #StressPaMore dabah? That’s why it pays to be armed with PhilCare ER Vantage80 anytime for you to have a smooth sailing life that is free from any financial stress when it comes to health!